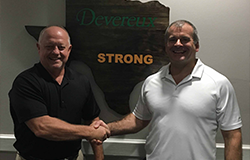 Devereux President and CEO Carl E. Clark II (right) toured the Devereux Texas campus, one year after Hurricane Harvey. 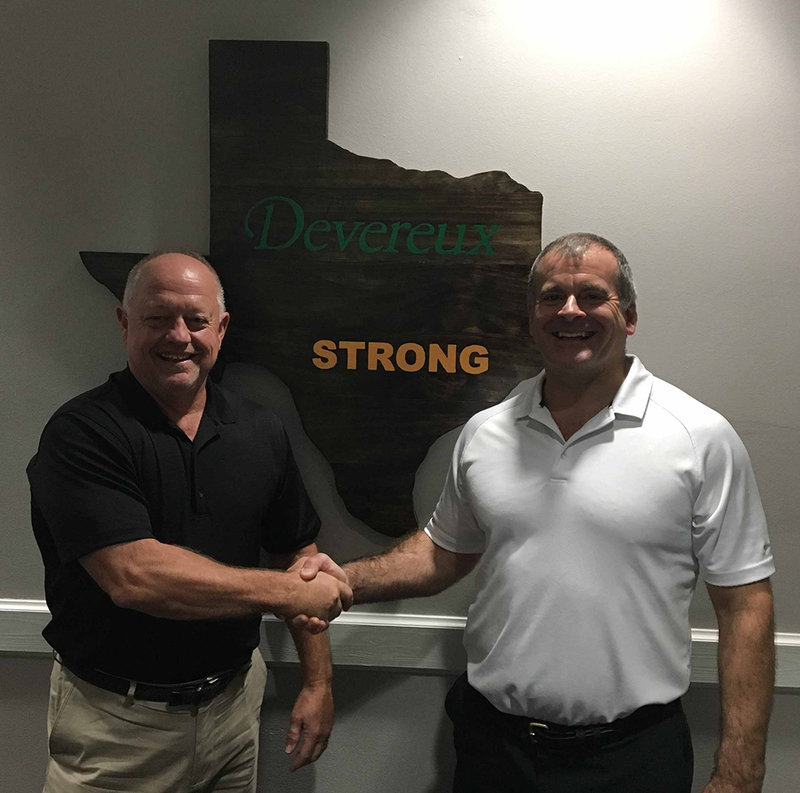 Carl is with Devereux National Director of Business Development Tom Duehren, who made the “Devereux Texas Strong” artwork in the background. In August 2017, Devereux Advanced Behavioral Health’s campuses in League City and Victoria, Texas, were put to the test when Hurricane Harvey made landfall. The Category 4 storm brought more than 50 inches of rain to the Houston area, causing devastating and widespread flooding – and significant damage to both Devereux Texas centers. In the midst of the hurricane, Devereux Texas relocated entire functions and facilities that serve the needs of more than 200 children, adolescents and adults with emotional, behavioral and cognitive differences – along with the more than 125 staff who care for them every day. Click here to learn how Hurricane Harvey impacted Devereux Texas. While Devereux’s Victoria campus was evacuated for several weeks, the damage to the League City campus was extensive and caused a prolonged evacuation. The majority of League City’s 11 buildings – including five residential buildings, dining hall, gym, outpatient clinic and the Devereux School – had up to 2 feet of floodwater that required a more complex recovery to address structural, electrical, plumbing, HVAC and fire safety issues, plus the rebuilding of built-in dorm furniture. It took a village, but thanks to staff from several Devereux centers, supportive community partners and generous local building contractors and donors, our Victoria and League City individuals and staff returned “home” in September and late December, respectively. When our teams – and the individuals in our care – moved back to their Devereux Texas campuses, the most significant repairs had been completed, but there was still much work to be done. Today, Devereux Texas reported that all repairs are expected to be complete by Thanksgiving 2019. Click on the links below to learn more about Devereux Texas’ programs and services for children, adolescents and adults. To learn more about Devereux Texas, click here. To connect with our Devereux Texas admissions team, click here.